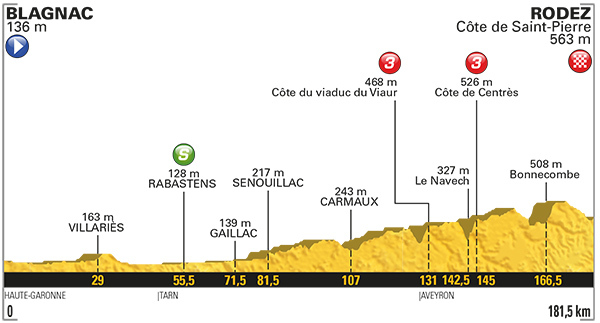 Weather at the finish city of Rodez at 2:00 PM, local time: 23C (74F), sunny with the wind from the NW at 19 km/hr (12 mph). No rain is forecast. The race: 177 riders started stage 14 at 1:22 PM local time. Thomas Voeckler attacked from the gun. He was quickly joined by four other riders. After 30 kilometers Thomas Voeckler (Direct Energie), Timo Roosen (LottoNL-Jumbo), Teo Hollenstein (Katusha), Thomas De Gendt (Lotto-Soudal) and Maxime Bouet (Fortuneo-Oscaro) were 2min 30sec ahead of the bunch. BMC, Sunweb and Bahrain Merida are performing the duty of leading the peloton. Km 47: The leaders are being kept on a short leash. The gap is 2min 7sec. The racers covered 42.6 kilometers in the first hour. The peloton is quite strung out. Km 72: The break is being held to 2min. Thomas de Gendt won the intermediate sprint. 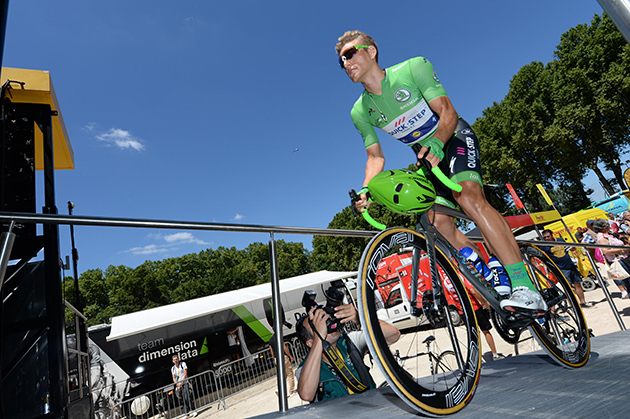 Marcel Kittel won the pack sprint, getting 6th place and earning 10 points towards keeping his green jersey. Km 95: The peloton is performing a very precise pursuit. The gap is two minutes. Km 110: Fabio Felline (Trek-Segafredo) abandoned. The gap to the Voeckler group is still two minutes. Km 130: On the first categorized climb, De Gendt is first over the Côte du viaduc du Viaur with Voeckler right on his wheel. Pack is 2min back. Hokey Smoke, Bullwinkle! Marcel Kittel has been dropped on the lumpy terrain. Team Sunweb is at the front speeding up the peloton to close in to the break. Km 140: Kittel has help, including teammate Fabio Sabatini, from several other riders working to get back up to the pack. Kittel did rejoin, but there is another climb coming. The finish. It was everyone together with 5 kilometers to go. 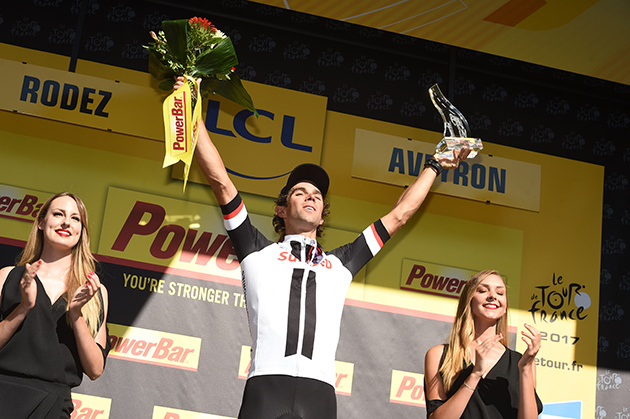 Michael Matthews won the stage with Greg van Avermaet second. The peloton split with Aru being caught out. So, Chris Froome is back in yellow! 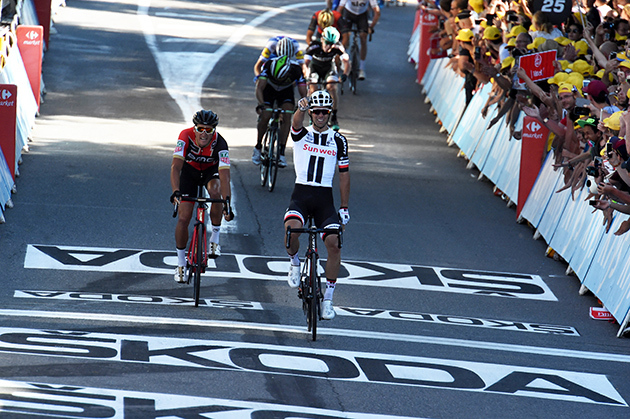 Set to substitute his arch-rival Peter Sagan who outclassed him on stage 3 in the first uphill sprint finish, Michael Matthews beat Olympic champion Greg Van Avermaet in Rodez where the Belgian found the confidence by outsprinting Sagan two years ago. 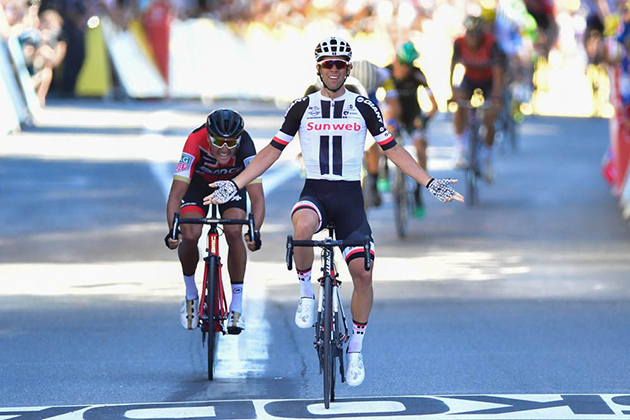 The Australian gave Sunweb a second straight victory after Warren Barguil made it in Foix. 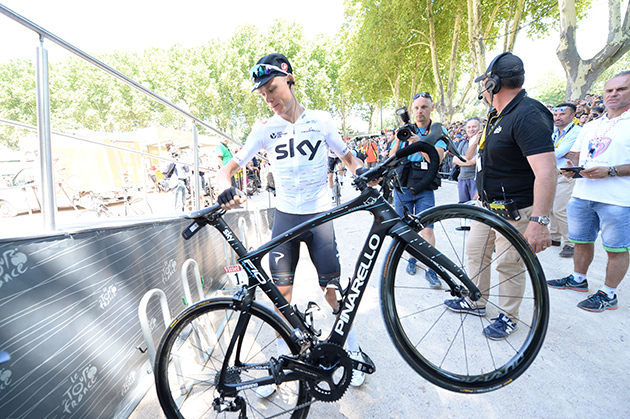 The steep finish favoured Chris Froome to move back into the yellow jersey. 177 riders started stage 14 in Blagnac. Thomas Voeckler (Direct Energie) attacked from the gun. He was quickly rejoined by Timo Roosen (LottoNL-Jumbo), Thomas De Gendt (Lotto-Soudal) and Maxime Bouet (Fortuneo-Oscaro) while Reto Hollenstein (Katusha-Alpecin) reinforced the leading group at km 14. Their maximum advantage was three minutes at km 25 as teams BMC and Sunweb of hot favourites Greg Van Avermaet and Michael Matthews prepared for an uphill finish from very far out. With the help of Jani Brajkovic (Bahrain-Merida), they maintained the time difference for two minutes for most of the stage. De Gendt won the intermediate sprint and crested the two categorized climbs in first position ahead of Voeckler. The leading quintet split in the côte de Contrès with 38km to go. De Gendt and Voeckler forged on while their former breakaway companions were brought back by the peloton. With 32km to go, De Gendt rode Voeckler off. The Lotto-Soudal rider stayed one minute ahead with 20km to go. He was reeled in with 12km to go after 170km in the lead. Maurits Lammertink (Katusha-Alpecin) counter attacked straight away. Damiano Caruso (BMC), Nikias Arndt (Sunweb) and Pierre-Luc Périchon (Fortuneo-Oscaro) accompanied the Dutchman at the front but it was all together again with 4km to go. After Belgian champion Oliver Naesen (AG2R-La Mondiale) disturbed the lead out trains, Philippe Gilbert (Quick-Step Floors) launched the uphill sprint in Rodez from far out but it was a duel at the top of the climb between the two riders everyone expected. Matthews proved to be a bit stronger than Van Avermaet. 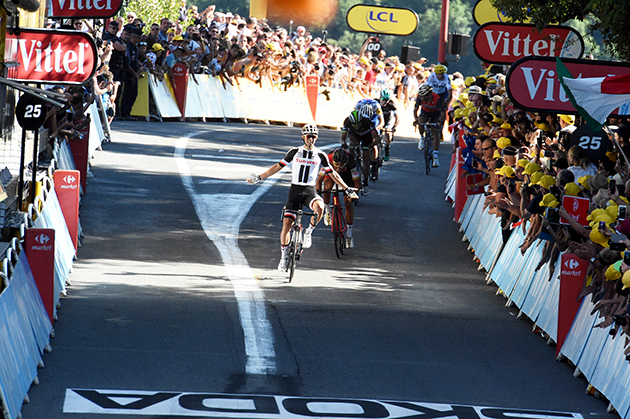 The Australian claimed his second stage win at the Tour de France one year after he did it in Revel. 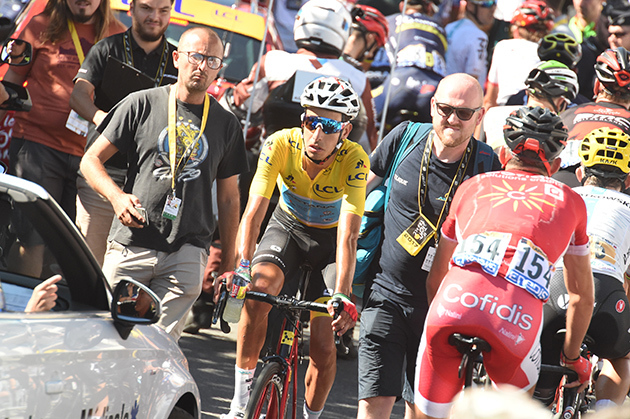 Splits in the peloton put Chris Froome back in the lead of the overall ranking with an advantage of 19 seconds over Fabio Aru and 23 over Romain Bardet. 12 STYBAR ZDENEK QUICK-STEP FLOORS s.t. 13 YATES SIMON ORICA-SCOTT s.t. 14 BAKELANTS JAN AG2R LA MONDIALE s.t. 15 MARTENS PAUL LOTTO NL-JUMBO s.t. 17 BOUHANNI NACER COFIDIS s.t. 20 LANDA MIKEL SKY s.t. 22 CARUSO DAMIANO BMC s.t. 24 CONTADOR ALBERTO TREK-SEGAFREDO s.t. 25 BENNETT GEORGE LOTTO NL-JUMBO s.t. 27 BRAMBILLA GIANLUCA QUICK-STEP FLOORS s.t. 28 MEINTJES LOUIS UAE TEAM EMIRATES s.t. 29 BUCHMANN EMANUEL BORA-HANSGROHE s.t. 30 ARU FABIO ASTANA s.t. 32 IMPEY DARYL ORICA-SCOTT s.t. 33 PICHON LAURENT FORTUNEO-OSCARO s.t. 35 HARDY ROMAIN FORTUNEO-OSCARO s.t. 37 BETANCUR CARLOS ALBERTO MOVISTAR s.t. 38 HENAO SERGIO LUIS SKY s.t. 40 MINNAARD MARCO WANTY-GROUPE GOBERT s.t. 42 KRISTOFF ALEXANDER KATUSHA-ALPECIN s.t. 43 TULIK ANGÉLO DIRECT ENERGIE s.t. 46 PAUWELS SERGE DIMENSION DATA s.t. 49 POLJANSKI PAWEL BORA-HANSGROHE s.t. 50 MOLLEMA BAUKE TREK-SEGAFREDO s.t. 51 ARNDT NIKIAS TEAM SUNWEB s.t. 52 BARGUIL WARREN TEAM SUNWEB s.t. 53 SMITH DION WANTY-GROUPE GOBERT s.t. 54 HANSEN ADAM LOTTO SOUDAL s.t. 57 FRANK MATHIAS AG2R LA MONDIALE s.t. 59 POLITT NILS KATUSHA-ALPECIN s.t. 60 ULISSI DIEGO UAE TEAM EMIRATES s.t. 61 BURGHARDT MARCUS BORA-HANSGROHE s.t. 64 BROWN NATHAN CANNONDALE-DRAPAC s.t. 65 DEGAND THOMAS WANTY-GROUPE GOBERT s.t. 67 DOMONT AXEL AG2R LA MONDIALE s.t. 68 ZUBELDIA HAIMAR TREK-SEGAFREDO s.t. 69 ATAPUMA JOHN DARWIN UAE TEAM EMIRATES s.t. 70 NIEVE MIKEL SKY s.t. 71 MACHADO TIAGO KATUSHA-ALPECIN s.t. 77 BODNAR MACIEJ BORA-HANSGROHE s.t. 78 MARTIN TONY KATUSHA-ALPECIN s.t. 79 DE KORT KOEN TREK-SEGAFREDO s.t. 80 KREUZIGER ROMAN ORICA-SCOTT s.t. 82 DURASEK KRISTIJAN UAE TEAM EMIRATES s.t. 87 SCHÄR MICHAEL BMC s.t. 90 DE GENDT THOMAS LOTTO SOUDAL s.t. 91 VALGREN ANDERSEN MICHAEL ASTANA s.t. 104 WYSS DANILO BMC s.t. 106 VACHON FLORIAN FORTUNEO-OSCARO s.t. 107 ROWE LUKE SKY s.t. 108 BRAJKOVIC JANEZ BAHRAIN-MERIDA s.t. 109 LUTSENKO ALEXEY ASTANA s.t. 111 VOECKLER THOMAS DIRECT ENERGIE s.t. 112 ROCHE NICOLAS BMC s.t. 113 GENE YOHANN DIRECT ENERGIE s.t. 117 TEUNISSEN MIKE TEAM SUNWEB s.t. 120 SIMON JULIEN COFIDIS s.t. 123 SINKELDAM RAMON TEAM SUNWEB s.t. 124 EISEL BERNHARD DIMENSION DATA s.t. 125 SIEBERG MARCEL LOTTO SOUDAL s.t. 127 VAN KEIRSBULCK GUILLAUME WANTY-GROUPE GOBERT s.t. 128 SÜTTERLIN JASHA MOVISTAR s.t. 131 SELIG RÜDIGER BORA-HANSGROHE s.t. 132 BAK LARS YTTING LOTTO SOUDAL s.t. 133 SABATINI FABIO QUICK-STEP FLOORS s.t. 135 MATE MARDONES LUIS ANGEL COFIDIS s.t. 137 CURVERS ROY TEAM SUNWEB s.t. 139 LAENGEN VEGARD STAKE UAE TEAM EMIRATES s.t. 140 HOWSON DAMIEN ORICA-SCOTT s.t. 141 ROGLIC PRIMOZ LOTTO NL-JUMBO s.t. 143 CASTROVIEJO JONATHAN MOVISTAR s.t. 144 OFFREDO YOANN WANTY-GROUPE GOBERT s.t. 145 GESBERT ELIE FORTUNEO-OSCARO s.t. 147 SEPULVEDA EDUARDO FORTUNEO-OSCARO s.t. 148 KNEES CHRISTIAN SKY s.t. 149 NAVARRO DANIEL COFIDIS s.t. 150 GRIVKO ANDRIY ASTANA s.t. 152 SENECHAL FLORIAN COFIDIS s.t. 153 CLAEYS DIMITRI COFIDIS s.t. 154 CINK ONDREJ BAHRAIN-MERIDA s.t. 155 PASQUALON ANDREA WANTY-GROUPE GOBERT s.t. 156 ROELANDTS JURGEN LOTTO SOUDAL s.t. 157 BOLE GREGA BAHRAIN-MERIDA s.t. 158 GOGL MICHAEL TREK-SEGAFREDO s.t. 159 PANTANO JARLINSON TREK-SEGAFREDO s.t. 160 KOZHATAYEV BAKHTIYAR ASTANA s.t. 162 TALANSKY ANDREW CANNONDALE-DRAPAC s.t. 163 SICARD ROMAIN DIRECT ENERGIE s.t. 164 MOINARD AMAËL BMC s.t. 165 HALLER MARCO KATUSHA-ALPECIN s.t. 166 TIMMER ALBERT TEAM SUNWEB s.t. 167 ROLLAND PIERRE CANNONDALE-DRAPAC s.t. 168 HAYMAN MATHEW ORICA-SCOTT s.t. 171 GRUZDEV DMITRIY ASTANA s.t. 172 VANSPEYBROUCK PIETER WANTY-GROUPE GOBERT s.t. 173 BOZIC BORUT BAHRAIN-MERIDA s.t. 174 PHINNEY TAYLOR CANNONDALE-DRAPAC s.t. Marcel Kittel before the stage start. Stage winner Michael Matthews has enough of a lead to sit up well before the line. And the stage is his. Aru just after the stage. He surely knows he's lost the lead at this point. 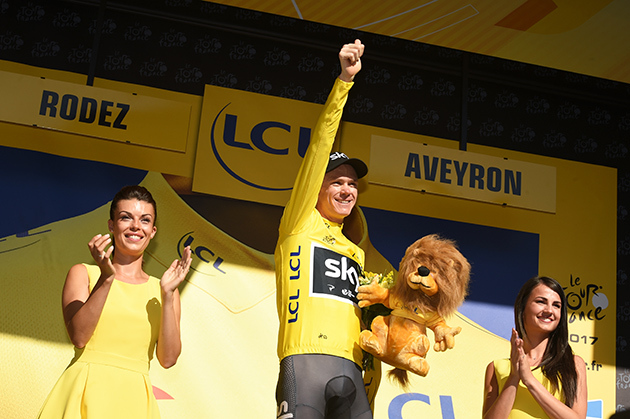 Chris Froome is back to collecting stuffed lions. 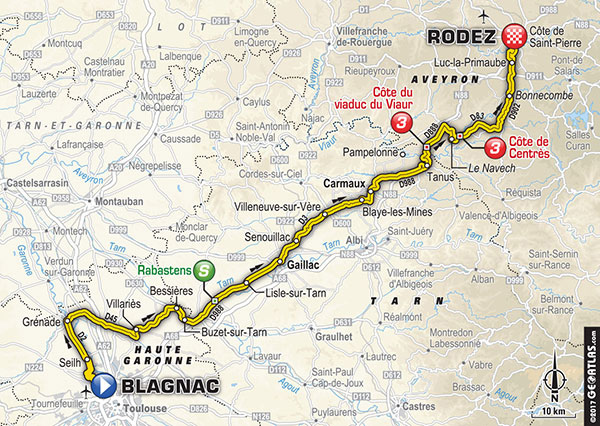 A stage from Blagnac to Rodez has been done before but on a very different course. Back in 1984, it was also a Tour of glory for French riders. Pierre-Henri Menthéour delivered the sixth stage victory for the Renault team that was also going to win the Tour with Laurent Fignon. Tony Gallopin is the kind of Frenchman expected to shine in Rodez but it'll be hard for the whole bunch to keep Lilian Calmejane calm! The winner of stage 8 is the enfant du pays as he'll pass very near his hometown of Albi. Two years ago, Greg Van Avermaet claimed his first stage victory at the Tour de France in Rodez where he outsprinted Peter Sagan and took a monkey off his back after losing so many races. 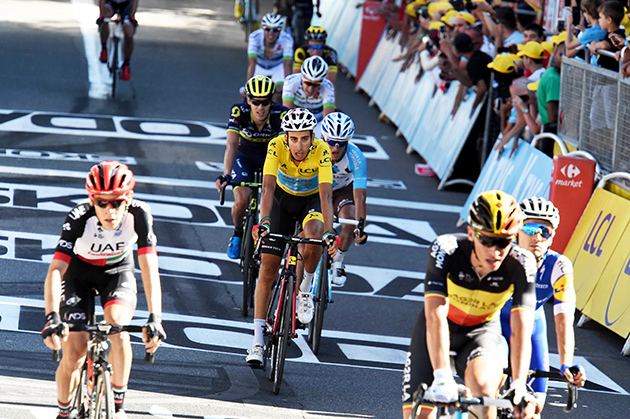 It was the starting point of brilliant campaigns that made him a yellow jersey at the Tour de France last year, the Olympic champion and the winner of Paris-Roubaix this year. Due to the bad luck BMC encountered with Richie Porte crashing out, Van Avermaet is the hot favourite atop the côte de Saint-Pierre in Rodez. It's a short one: only 570 metres but it's very steep with an average gradient of 9.6%. Another occasion for Romain Bardet and Fabio Aru to gain a few more seconds onto Chris Froome before the Alps?